Or Chana masala, Chickpeas Curry. 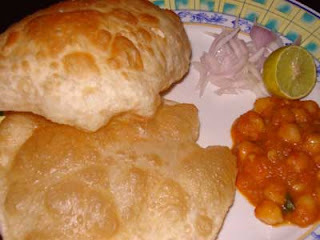 How can I talk about Bhatura and not mention Chole!. 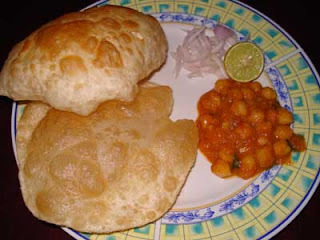 Well we normally make Channa curry for pooris or chappattis, but with Bhaturas it tastes simply out of this world. The version that was prepared this time, was a very simple one. To get thick consistency we added potatoes. Else this can be made without Aloo also. Soak Channa overnight, (atleast for 6 hours) in water. Pressure cook it along with Potatoes, to get tender channa dal. Ensure its not soggy. Cut Onions, Tomatoes into pieces. Add fresh Ginger, Garlic and make everything into fine paste. Then add the cooked Channa to the kadai. Mash all the potatoes and add to the gravy to get thick consistency. Sim it for a while until you get a thick gravy. You can add the potatoes as cubes, also but mashed potatoes make gravy thick. If you want to add it as cubes, then pressure cook Channa and keep it for 2 whistles, then add potatoes and again put on whistle for 2 more. I thick everybody mostly pressure cooks channa otherwise it takes lot of cooking time. Finally garnish it with Coriander leaves, Onion and Lime pieces. This is a joyful dish enjoy!